Plank was born on April 23, 1858, in Kiel, Germany: His family taught him the principles of loyalty, devotion to excellence, and dedication to education. Educated at one of the premier schools in Munich, where his father was appointed to the university, Planck became a well­ rounded pupil who excelled in all subjects. 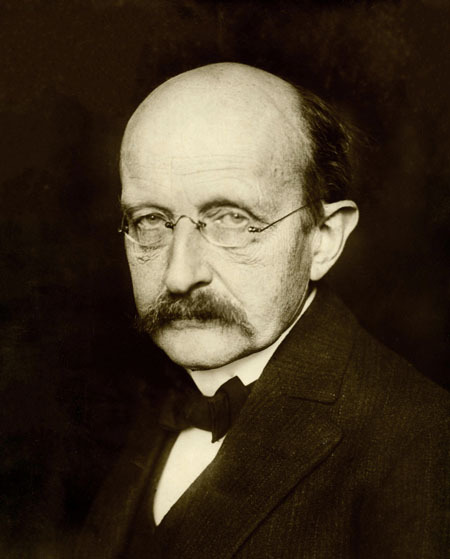 Deciding finally on pursuing physics, Planck was only 21 when he received his doctoral degree from the University of Munich, where his work had centered on the laws of thermodynamics. Planck was appointed to the University of Berlin in 1889, where he remained for the rest of his career. In the 1890s Plank began analyzing “black bodies,” theoretical objects that emit amounts of energy equivalent to the energy they absorb. Attracted by the seeming perfect symmetry of emission and absorption in black bodies, Plank explored theoretical formulas for how the electromagnetic energy emitted by black bodies related to varying frequencies and temperatures. The best theoretical models did not fit the actual experimental results, and Planck wanted to find a way to bring the theory and results into a closer fit. Planck made a simple assumption that the energy of the atoms in the black body could only be transferred in or out in certain­ sized pieces, depending on the frequency of the light given off or absorbed. He regretted the step because it was so arbitrary; there was no known physical reason why energy should “clump up” in that way. However, his new theoretical model worked perfectly and matched the results of experiments very well. In 1900, at age 42, Planck published his results, which described how electromagnetic radiation was emitted and absorbed in little bundles, or quanta. For his new model, he developed what later became known as Planck’s constant, which established the relationship between the energy content of the radiation and its frequency. He received the Nobel Prize for Physics for this work in 1918. Planck’s age, demeanor, and character, coupled with his successful theoretical work, elevated him to a revered status among his fellow scientists. In 1930 he became president of the Kaiser Wilhelm Society, the most prestigious scientific organization in Germany, which continues today as the Max Planck Society. While other scientists fled Germany before World War II or took up the absurd scientific policies of the new Nazi government, Planck chose to remain in the country and do what he could to preserve German science. He died in Göttingen on October 4, 1947. Planck created the basis for quantum theory, one of the most important propositions in contemporary physics. His influence was both immediate and extensive, stimulating other scientists to confirm his results and build upon them. ALBERT EINSTEIN, working independently, extended Planck’s ideas, especially in relationship to light. In 1905 Einstein proposed the idea of wave­ particle duality, stating that some entities have properties of both waves and particles: if light waves can act like particles, then particles of matter, like electrons, might have wave properties. Mathematician HENRI POINCARÉ established a mathematical proof for quantum theory in 1911, and in 1913 NIELS BOHR applied quantum theory to the hydrogen atom, thereby further establishing its validity in the scientific community. Advances came quickly in quantum theory largely because Planck had gathered an unprecedented pool of brilliant scientists in Berlin. He brought Einstein there in 1914, along with other scientists. His support of other young scientists was often direct and of vital importance. LISE MEITNER secured her position at the Chemical Institute in Berlin because Planck spoke up for her to the Institutes director, and Einstein’s first paper on relativity would not have been published without Planck’s intercession with a publisher. By the mid­1920s physicists had developed quantum mechanics, offering a full system of mechanics to explain the behavior of atomic and subatomic particles based on quantum theory. In several formulations, including MAX BORN’s and WERNER HEISENBERG’s wave matrix theory and Louis V. de Broglie’s and Erwin Schrödinger’s wave mechanics, quantum mechanics completely reshaped the understanding of the rules at play on the atomic and molecular level. And the discoveries keep coming; even today there is serious disagreement about what quantum theory means, and it continues to stretch our ability to grasp the real nature of the universe.